Back a few months ago, Sig Sauer won a huge contract, worth almost half a billion dollars, to supply the United States Army with a new service pistol. Securing this contract was undoubedtly a huge success for the gunmakers, but recent developments in New Jersey means they could come under increased scrutiny in the coming months. The issue is that the New Jersey Attorney General has just initiated a lawsuit against the company, claiming that some of the guns issued to police in that state were almost unusable. The problem is with the P229 9mm semiautomatic pistol. Three thousand of these weapons were supplied to New Jersey police in 2014, but the law enforcement officers claim that they repeatedly jammed, to the point to which they were essentially impossible to use. Police returned the weapons to Sig Sauer several times in the years following, but say that every time they did so the pistols remained problematic. Even after the gunmaker replaced a whole batch of the guns, the same problems persisted. This may not come as a surprise to many of you. We in the gun enthusiast community have been pointing out the problems with these pistols for many years now. I know of very few gun owners who were happy after purchasing one of these pistols, and even fans of it admit that it can be very high maintenance. For most of us, a pistol jamming repeatedly is certainly an annoying issue, and perhaps one that would lead us to return a firearm. For police officers, the stakes are much higher – limited to the weapon they are issued with, they are putting themselves in danger if they carry a defective weapon. A pistol jamming in a dangerous situation can be lethal. In this context, it is even more astonishing that this issue was picked up before the pistol was even issued for live service. Several of the experts charged with testing the gun on the range noted that it regularly jammed even when new, and even when in a controlled environment. Even after multiple upgrades, these guns still jammed. Even when police thought they had found the source of the problem – that Sig Sauer had in fact supplied them with a slightly different version of the pistol – problems continued. And so, in February 2016, after some two years of testing, upgrades, and arguments, the New Jersey police withdrew the guns from service and issued Glock 19s. They are suing Sig Sauer not just for the cost of the weapons, but also for the now-useless holsters they came with. When I read this story, I admit that I laughed. Not, of course, that putting police officers in danger is a laughing matter – quite the opposite. I laughed because we in the community have known for a long time about the problems with these Sig Sauers. 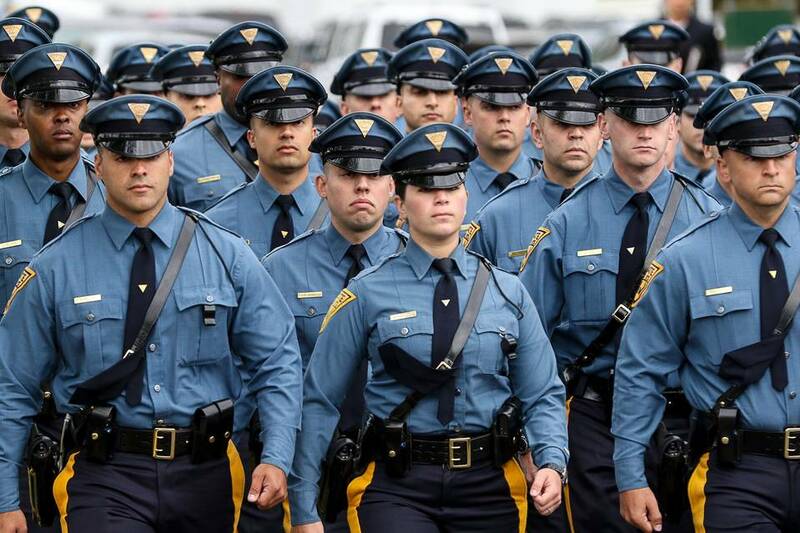 Had the New Jersey Police spent any time looking through gun enthusiast forums, or come and spoken to us, we could have saved them a lot of time and money. Safety is extremely important for all firearms. Gun safes are a vital form of safety in your home. When at the range we recommend quality shooting glasses and hearing protection. Just look at these faces, most are frowning in dis-content. Is this really the type of people that we want to arm and send out to interact with the public??? Also what is up with that upside-down pyramid on each and every police cap and tie being worn??? Have the freemasons infiltrated our law enforcement agencies to such a great extent??? First they used the chess-board squares around the rim of the hat / cap to signify the freemasonic connection and now the pyramid as well??? Globalism making progress and making sure that a tyrannical and dictatorial socialism is coming to your location!! !